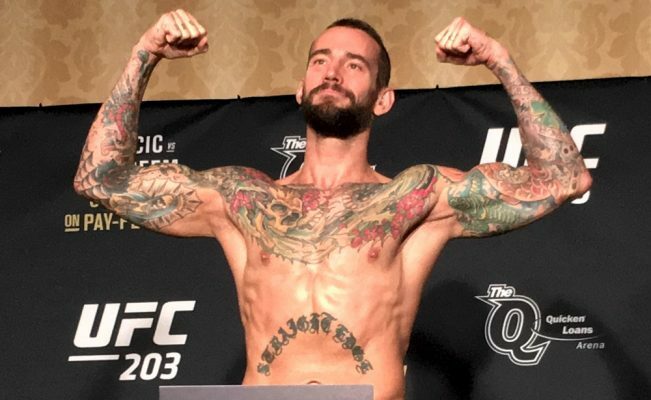 By all accounts, CM Punk’s career with the UFC is finished after going 0-2 inside the Octagon. The former WWE superstar (real name Phil Brooks) made waves when he signed with the UFC back in 2014 and then finally made his professional debut a little over a year and a half later where he was soundly defeated by welterweight prospect Mickey Gall. While Punk didn’t last three minutes in his debut, UFC president Dana White decided to give him one more shot at proving himself. That resulted in Punk losing a lopsided decision to Mike Jackson this past weekend at UFC 225 and afterwards White intimated that was the end of the chances he’d be giving the 39-year old mixed martial arts enthusiast. Despite the fact that Punk lost both of his fights in a one-sided manner, White says he doesn’t regret giving him a shot to live his dream by fighting in the UFC. White adds, however, that he still isn’t happy with Punk’s opponent from this past weekend, who he accused of showboating during the fight and not even bothering to go for the finish despite having his opponent hurt on several occasions. “The thing was CM Punk would come to the fights and he was such a huge fan and he wanted to try this. I gave the guy a shot. I’ve never done really anything like that, except for Brock Lesnar. It worked out with Brock, it didn’t work out with Punk,” White explained when speaking after the latest edition of the Tuesday Night Contender Series. As far as Punk’s future goes, White has said he hopes the former professional wrestler calls it a career and gives up his aspirations to become a full time mixed martial artist. White added that he hasn’t spoken to Punk since the fight but he hopes that’s the direction he’ll take following this second loss in the UFC.